Do you have news, reviews or comments for 'A Star Is Born'? Warner Bros' A Star Is Born was the 10th most profitable movie of 2018, thanks to Bradley Cooper and Lady Gaga. The actors are cooking something up four decades after their version of A Star Is Born hit theaters. UK audiences were spellbound by the Fantastic Beasts sequel this week, but is the love for the Wizarding World starting to wane a bit? This weeks top movie in the UK took an excellent £12.3 million at the UK box office on its debut and although this makes it the 54th top opening film in the UK its £3 million lower than Fantastic Beasts And Where To Find Them. Its only natural that after nearly 20 years of magical films audiences have seen it all before and don't rush to the cinema to see new films from the Wizarding World. As we have seen this year with Star Wars movies and in the past with film series like The Hobbit even die hard fans can get too much of a good thing and will wait to see a movie. Making its debut at the top last week the animated retelling of the Dr. Seuss story falls to 2 this week with a £3.9 million weekend pushing its total to £10 million. Still wowing audiences in the UK is the Queen bio-pic which after 4 weeks of release still manages a £3 million weekend which brings the films total UK gross to £34.8 million. The film is now the 8th top film of 2018 and the 90th top grossing film ever in the UK. The Steve McQueen directed movie is at number 4 this weeks with a weekend gross of £882,243 which brings the films total takings to £4.3 million. There has been no stopping this Bradley Cooper directed film in the UK as the film has a 7th weekend in the top 5 with £0.7 million which brings the films total to £27 million. We're fast approaching the Christmas period and despite it still only being early in December the UK public are clearly in the mood as they take The Grinch to the top of the box office on its debut weekend. 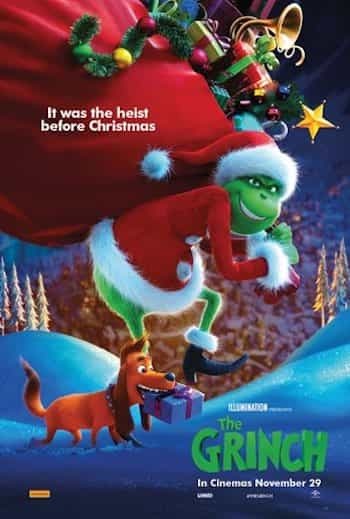 The last time The Grinch appeared on the box office was back in 2000 in the shape of Jim Carey in a live action version directed by Ron Howard which took £3 million on its debut weekend which is about £5.2 million when adjusted for inflation. Both films have hence sold in the same ball park as far as tickets are concerned, time will tell is this new animated version will out gross the 2000 film. After a very successful couple of weeks at the top of the box office the Queen bio-pic falls to number 2 with a weekend gross of £4.5 million, not far behind The Grinch. This boosts the films total Uk gross to £28.9 million and its the 10th best film of the year to date. Acclaimed director Steve McQueen brings his latest movie which lands at 3 on its debut weekend with a gross of £2.4 million. The film starring Viola Davis and Liam Neeson is getting a lot of positive buzz and Oscar talk to expect it to hang around until the new year and awards season. The Bradley Cooper film is starting to fall down the chart after a very successful run and this week is at 4 with £1.2 million boosing its total to £25.4 million. Finishing off the top 5 this week is last weeks highest new film which falls hard in its second weekend, the Diney film takes £1.1 million for a £3.14 million total. The power of Bohemian Rhapsody was too strong for any new comers as the Queen film stays at the top of the UK box office for a second weekend. After the excellent £9 million debut last weekend there is no surprise that it manages a second weekend at the box office summit. Posting a second weekend gross of £5.7 million the Bryan Singer directed film may not have been a hit with the critics but is proving to be popular with the paying public. The films total UK gross now sits at an incredible £20.4 million after 10 days of release. The Lady Gaga starring film is proving to be a bigger hit in the UK than many other parts of the world as the film spends another week at number 2 taking £1.8 million after 5 weeks of release. The film which currently has the number single in the UK and the number 1 album has now taken £22.9 million. Disney gets Christmas stared with the release of the popular story often performed as a ballet this time of year and it snaggs the highest new film at number 3. The film takes a reasonable £1.7 million on its debut weekend of release. The animated family film stays at number 4 this weekend £1.1 million which brings its total UK gross to £10.1 million. Still holding strong at number 5 this week the film has a 5th weekend gross of just over £1 million which brings its total to £16.3 million. Still hanging onto the charts as we enter the holiday season the film has notched up 15 week on the UK box office. Further down the chart at number 9 is the new Simon Pegg starring movie which makes its debut this weekend with a £400,00 gross. Another film worth mentioning makes its debut at number 3 this week in the shape of Mike leigh's latest which opens with £350,000. Freddie Mercury and the band Queen dominated the global box offie this week as they take their bio-pic Bohemian Rhapsody to the top of the world box office with Halloween falling to number 3. The film expanded wide this week with a terretory count of 65 and took an incredible $122.5 million in global grosses. This takes the Bryan Singer directed films total world gross to a very respectable $141.7 million after 2 weeks of release. Disney get the Christmas season off to an early start with their film adaptation The Nutcracker And The Four Realms which lands this week at number 2. Released in 46 countries the film took a very respectable $58.5 million on its debut week of release. After a very successful Halloween season for the horror film it drops to number 3 this week with $230 million from 67 countries. This brings the films total global gross to $294 million. The slow burning romantic drama directed by and starring Bradley Cooper is at number 4 this week with a $25 million gross from 74 countries to boosts its global cume to $294 million. Closing out this weeks global box office the Sony movie takes $23.4 million from 66 countries to boost its total world gross to an excellent $541.5 million. This weekend the Freddie Mercury/Queen film Bohemian Rhapsody got its North American release and took the top spot with ease on its debut weekend. Making an impressive debut at the top of the US box office the bio-pic took $50 million over its debut weekend. The film is directed by Bryan Singer so wont come near to being his top film at the US box office as he had major success with the X-Men movies. With such a good debut for the film we could see a far bigger total gross than studio expectations. Second new entry of the week comes in at number 2 in the form of Disney new film based on the short story The Nutcracker and the Mouse King. The film starring Keira Knightley and Directed by Lasse Hallstr�m and Joe Johnston takes $20 million on its debut weekend. Completing a trio of new released at the top of the US box office this Tyler Perry directed film comes in at number 3 with a debut weekend gross of $14 million. This film has turned out to be a bit of a slow burner as the Lady Gaga starring film spends a 5th week onside the top 5, this week at number 4 with $11.5 million. The film has now taken an excellent $165.6 million at the US box office. With the scare season over for another year the horror film takes a tumble down the chart from the top to number 5 this week. An $11 million weekend boosts the films total US gross to $150.4 million.